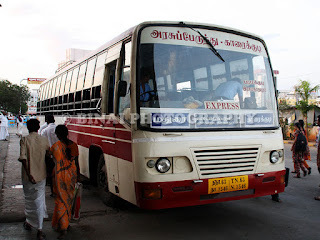 I had my eyeballs popping out when I saw all night buses from Coimbatore sold out for May 5, 2013. I reconfirmed by checking the operators' websites, and found it to be true. Some never heard-of operators had some seats vacant, but at exorbitant rates. I hoped someone operated a late evening trip from Coimbatore - but found none. Kallada's Hyderabad buses had some odd seat here-and-there, but did not book. Then I remembered about KaSRTC's services - the night ones were sold out, but the afternoon one had some tickets. I decided to take a service to Mysore instead, and got a seat in the evening "1614CBTMYS" schedule - which was actually their Mangalore service, operating as a "split service". I received a message from KSRTC at around 1500hrs giving details about my bus and the crew's phone number. I like this service a lot - it gives a lot of peace of mind. I vacated my room at around 1515hrs, and took a TNSTC bus towards Gandhipuram bus station. I got off the bus outside the Gandipuram BS itself, and headed into the SETC BS. I spent sometime photographing buses there, and then headed out of to a nearby bakery for some snacks. While at the bakery, I spotted my bus coming into the bus station - the buses are parked at the Mettupalayam road BS. It was 1545hrs then - a good 30 minutes to go. I packed some snacks and headed off to the bus station. The bus: KA-01-F-9056 of Mangalore-2 Depot. I did not board the bus immediately - just waited outside. The conductor had a tiff with a passenger there regarding the lack of identity proof, and some confusion in his booking. The station supervisor at Coimbatore managed the issue and made a remark on the waybill for the same. The bus was from Mangalore division, Depot-2. The maintenance looked good - there were a few dents here and there, but not really odd looking. The bus appeared full. The bus came to life around 1610hrs, and I got in after the AC was switched on. The bus finally started off at 1620hrs, about 6 minutes late. The bus was slow from the point we started. They picked up some local passengers from Ganapathy, and continued the run towards Mysore. We picked up a passenger from Annur (1702hrs) and continued. I dozed off for sometime - the heat had an effect on me for sure. I woke up just as we stopped at Sathy, near the SPS petrol bunk (1739hrs). The bus then took a right turn and went inside Sathy bus station - a few passengers got off here, but nobody joined us. It took all of 1h19m from Coimbatore to Sathy - compared to over 2 hours for the Conti bus on my inbound trip! A movie was played after Sathy - it was a fairly old Vikram starrer Tamil movie. The bus stopped briefly at Bannari RTO checkpoint due to a traffic snarl. After the check post, the bus stopped at a way-side temple before the ghats (1804hrs). The crew got off, and got a full pooja done! The poojari got in, applied sandalwood paste on the front windshield and then did a karpoora arathi. He then came around to collect money from the passengers. I did not like this part of a government bus stopping for a religious activity - does not really fall into our line of a secular government. We started off from the temple at 1809hrs. The driver appeared to be an expert in this ghat section - he maintained good pace in the ghats as well. I had travelled down the ghats earlier (read here), but this was my first experience ascending the ghats in a bus. This ghats, called the "Dhimbam Ghats" has 27 hair-pin bends. Three of them were tight - the bus almost touched the rocks at the turns. I was enjoying the run up the ghats in the bus - have driven up the ghats a couple of time earlier though. We stopped at "TNSTC Motel" at Hassanur for a break (1853hrs). This was a run down place - stinking place with garbage strewn around. The "restaurant" was a tin shed. The food was average as well, but thankfully not overpriced. I was sad looking at the place we stopped - but there were no better options anyway. I felt they could've carried on to Chamrajnagar instead. We started after the break at 1911hrs. I've always felt that Mangalore crew are very adamant about timings - they stick to timings. I had another short sleep after Hassanur. We passed Chamrajnagar at 2000hrs - infact stopped outside the bus station and took a couple of passengers. We were only 60kms from Mysore, and had over 2:30hrs left!! I dozed off for some more time. When I woke up, I was expected the bus to be around Nanjangud - but the route we took looked very unfamilar. I switched on my GPS to find out our exact location - it turned out that we were heading towards T.Narasipura, on the Kollegal route! Then the bus ran towards Mysore - wonder why they took this route avoiding the shorter and direct route via Nanjangud - this route surely had negligible traffic, though. I slept for some more time, and woke up just as the conductor announced Mysore. We were passing Mysore Zoo then. We finally pulled into Mysore Suburban KSRTC Bus Station at 2125hrs - a full 1h05m early!! To read about my journey further to Bangalore, go down further. 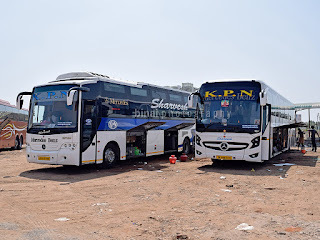 End Notes: The bus was KA-01-F-9056, of Mangalore-2 Depot. It had about 5.69 Lakh kms on the odo. It runs day in-and-day out through average roads, including the Sampaje and Dhimbam Ghats. The upkeep was good - barring some dents on the outside, the bus was largely in good shape. Did not hear any rattles anywhere from the body. I was impressed with the driving - he maintained steady pace throughout, and made it well before scheduled time. No rash driving, no unwanted honks. The driver appeared well trained as well - he did not lug the engine anytime. Blankets were not provided since its a "day" service. I loved the service on the whole. Will I take this service again? I do not travel on that route very often - but will recommend this bus. Mysore to Bangalore.. here begins the drama. It was election night, and buses were far and few. I did not realise this as I went inside a hotel in the bus station - the food was awful to say the least, and service was very lousy. I had a little bit of food, paid up and walked out. Headed straight to the "Bangalore" platform. The place was crowded, but there was no sign of Airavats. There was one Rajahamsa standing, but that was already full. I decided to wait for some more time. Clock ticked past 2230hrs, and there was no sign of an Airavat or a Rajahamsa! There were lots of people waiting as well. Sometime later, around 2235hrs, a Vaibhav rolled in. Did not want to lose the opportunity, and hence got in and booked a seat. 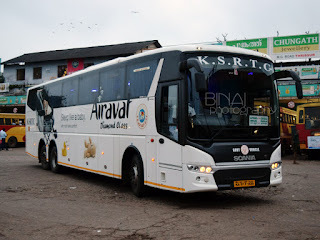 Like me, a lot of other people too got in, and kept looking out of the window if an Airavat turns up. The conductor sold tickets - the fare was Rs. 140, if I remember correctly. The bus was only upto Satellite BS in Bangalore. The bus finally started off at 2308hrs. I asked the conductor about the expected arrival time - he replied, "in 3 hours". I called up a cab operator in Bangalore and arranged to be picked up from Satellite BS - at 0200hrs. I hoped the bus would reach earlier than expected since it a late night "non-stop" trip. I dozed off soon after we started off - vaguely remember passing Srirangapatna. The bus stopped for a tea break at a way-side shop somewhere near Mandya - did not notice the timings. I woke up as the cab driver called me - it was 0210hrs then. He asked about my whereabouts, and I told him the exact pick-up location. He promised to turn up in another 10~15 minutes. We finally pull into Satellite bus station at 0220hrs - 3h12m after we started from Mysore. That was for a distance of 133kms in 192 minutes! I hope the driver wasn't pushing it by hand instead of driving. Terribly disappointed at such a lousy service - that too at night. I am sure the Sariges would've been faster. I will never ever take a Vaibhav again. The cab was there as promised. It seems the cab had already reached Nayandahalli at 0045hrs, and the driver had slept off. He got worried when I did not call up till 2AM, and called me to find out. I liked that service. The cab was well kept, and the driving was good. He charged me by meter and gave a bill without even asking for one. The operator was CelCabs - will surely try them again. 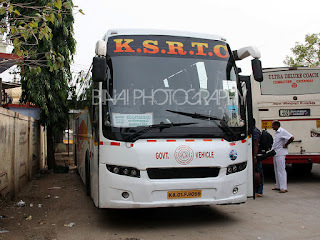 Its really unbelievable that Ka SRTC reached more than 1 hour ahead schedule! I have never seen this! By the way, I would like to know which cab you called and charges, coz I would also likely to reach BLR at odd hours and could call a favourable operator. Wat is the meaning of split service?